Game Of Thrones S5.05 "Kill The Boy"
We’re half way through season 5 and yet it still feels like Game of Thrones is setting up the series. Provided there’s a big pay off to this build-up then perhaps the slow start can be forgiven, but now we’re so far from book territory it’s hard to tell what that pay off will be. And yet to a book reader this feels like a terrifyingly fast pace - without going into too many details so much fat has been trimmed from both A Feast For Crows and A Dance With Dragons that we’re quickly catching up to, taking over and veering completely away from the book plot lines. But a quick pace by comparison isn’t how the show should be judged - even a book reader’s patience can grow thin - so let’s hope this is simply the calm before the storm. Last week’s episode ended on a heart stopping cliffhanger, with both Grey Worm and Ser Barristan lying in pools of their own blood. This is quickly resolved in episode five, with the first shot being of Grey Worm recuperating. We get to see a heartwarmingly lovely scene between him and Missandei and to be honest, it’s been a long time coming. We rarely get happy love stories in Game Of Thrones though, so this is bound to end in tears. My tears, and lots of them. Maester Aemon is full of excellent speeches this week. His frank discussion of Daenerys’s situation is moving, you get the hint that if he were younger the maester might seriously consider breaking his vows to aid his only remaining relative and yet he’s also content with the life he has. His speech to Jon (baring a few pronoun changes) would be exactly the right words for Dany to hear. He can’t help his Targaryen family, but he can help his brother Jon, another young leader with few friends and plenty of enemies. Jon’s decision to offer peace and safety to any Wildlings isn’t popular and he didn’t exactly have lots of friends already. Even Dolorous Edd, who has been sadly absent this so far this season, disagrees, and for very understandable reasons (we miss you Grenn and Pyp). His mission to Hardholme with Tormund Giantsbane will hopefully provide some of the excitement this season has been lacking. Nothing new this week bu we think the smoking ruins of Valyria would have been a good addition. Slightly further south Sansa is getting acquainted with her new family, and dinner with the Boltons goes about as well as you’d expect. Ramsay properly introduces her to Reek mid-dinner, and keeps bringing up Sansa’s dead family. Poor table manners but then you’d expect nothing less from a savage Bolton. Sansa is proving to be stronger than she was in previous season, she might look sullen, but there’s strength there. Enough to tell the Boltons that they are the strangers in Winterfell not her, and enough to brave the kennels and Theon’s broken state with both pity and anger for what has happened to him. The best bit this week though is the voyage with Tyrion and Jorah. Tyrion is in withdrawal from his budding alcoholism and Jorah is gruff and grumpy, until they begin bonding over a mutual love of poetry. Their journey through the smoking ruins of Valyria, punctuated by the verse is, chillingly atmospheric. Watching Drogon swoop over the towering ruins is breathtaking - this is a big reminder that yes, we’re watching fantasy, not a historical drama. But it’s the Stonemen’s attack that seals this as the most exciting part of the episode. 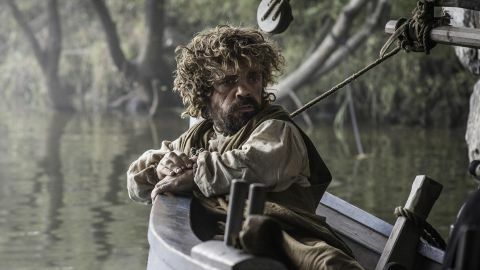 The desperate, frantic struggle to keep the Stonemen from touching anyone had us on the edge of our seats, and for a moment, when Tyrion plunged below the water, his death was a genuine concern. Of course in the end he escapes unharmed - it’s Jorah that we have to worry about. Despite saying he wasn’t touched Jorah is now afflicted with greyscale. Will he live long enough to go mad? Can he be cured like Shireen Baratheon? We don’t know. We’re totally Off Book here. Sailing uncharted waters through creepy ruins, filled with hostile scriptwriters ready to plunge their pens straight through to your heart. So this is what it feels like to be a non-book reader. It’s scary. Not sure how people managed it all these years. Maester Aemon gets the honour of saying this week’s episode title during his speech to Jon about the hardships of leading the Night’s Watch, telling Jon to “kill the boy” and become a man. Stannis once again proves himself to be the best choice for king, as he quietly corrects the grammar of a Night’s Watchmen. Valyria, the ancestral home of the Targaryens, was destroyed by a mysterious cataclysm centuries before the current plot began (although it seems like it was probably something volcanic in nature). The Targaryen's, warned of the doom in a prophecy by Daenys The Dreamer, moved to Dragonstone off the coast of Westeros before the civilisation was destroyed, and thus the Targaryen family began their conquest of The Seven Kingdoms. Dany faces down the consequences of last weeks fight, Sansa gets acquainted with her new family and Jon Snow makes a difficult decision.